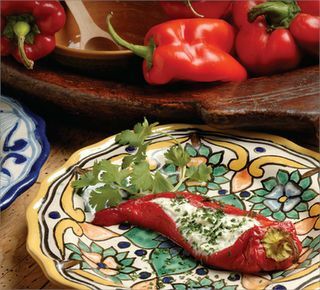 This wonderful stuffed pepper recipe comes from Greens Restaurant in San Francisco. The recipe calls for Gypsy peppers (also called bull's horn peppers) but any frying pepper will work. We stuff the peppers with Fromage blanc, ricotta, or fresh goat cheese (or a combination of) and fresh herbs. Very simple and fast to prepare but the flavor is astounding! Rub the peppers with olive oil, the 1/2 teaspoon salt, and the 1/4 teaspoon pepper. Place the peppers on a baking sheet and roast for 15 to 20 minutes, until the skin is blistered and the flesh is soft. Remove from the oven and let cool to the touch. Peel the peppers, being careful to remove the skin around the stems, leaving the stems in place. Make a lengthwise slit into each pepper and remove the seeds. Sprinkle the peppers with more salt and pepper. Decrease the oven temperature to 375 F. Oil a baking sheet. For the filling: Combine all the ingredients in a medium bowl and mix well. Gently spoon 1/4 cup of the filling into each pepper. Place the peppers, seam side down, on the prepared pan. Bake for 25 to 30 minutes, until the peppers are puffed and the filling is set.